From what we hear, the Bob Benza and Tom Martino connection in building NHRA Pro Stock engines is gaining traction. Our sources tell us in the upcoming week they will announce a well-known engine lease client. The drivers and crew chiefs aren't the only ones shuffling around during this silly season. Word has it the Rocky Boots sponsorship, previously held by Kalitta Motorsports, has moved over to Don Schumacher Racing where the brand will adorn Matt Hagan's Funny Car for a partial schedule as the primary sponsor in 2013. CHANGES COMING TO JOHN FORCE RACING? Word has it changes are coming to John Force Racing for 2013, and from what our sources are telling us these changes are positive. The JFR team will have Brittany testing her Top Fuel dragster at PBIR with every anticipation of a Pomona debut. Read more about CHANGES COMING TO JOHN FORCE RACING? TJ TO TEST TOP FUELER? Multiple sources have told CompetitionPlus.com when Don Schumacher Racing heads to Palm Beach International Raceway for testing, Tommy Johnson Jr. will be behind the wheel of the No. 3 dragster during the December test session. What his long term future is remains unknown as the DSR camp is tight-lipped on the future of this car. Read more about TJ TO TEST TOP FUELER? For fans of the Shakedown at E'Town event, a reliable source has told CompetitionPlus.com the event, which was said to have ended following this year's event, will apparently have new guidance at a new location. We are told with the blessings of founder/promoter Dave Hance, the event will move to Norwalk, Ohio's Summit Motorsports Park where it will become The Shakedown at the Summit. The event is expected to field the same classes as the Englishtown event. Read more about SHAKEDOWN AT THE SUMMIT? ADRL TO CORDOVA? NORWALK COMING BACK? While there is much speculation the remaining two dates for the ADRL will be run at tracks based in Illinois and Ohio. Our sources tell us for the first time, ADRL will drift into Cordova, Ill. and return to Norwalk, Ohio. Expect an official announcement on Friday during the IMIS show. Read more about ADRL TO CORDOVA? NORWALK COMING BACK? DR. MOON'S RAGE RETURNS IN A NEW NEIGHBORHOOD? Remember the beautiful Dr. Moon's Rage cars of the early years of the NHRA Pro Modified series? Word has it the theme will return in 2013 with driver Von Smith driving the Howard Moon-tuned, supercharged 1968 Camaro fielded under the Al-Anabi umbrella. Another traditionally maroon and gold colored Al-Anabi 1968 Camaro will hit the track as well but at this time the driver is unknown. Both cars will run as Pro Extreme, while the series remains unknown. Read more about DR. MOON'S RAGE RETURNS IN A NEW NEIGHBORHOOD? BROGDON - KENT RACING MAKES KEY PERSONNEL ACQUISITIONS? 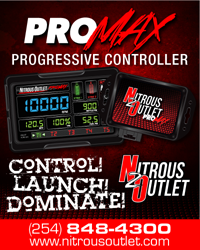 The news continues to trickle out of the Pro Stock ranks with a source telling CompetitionPlus.com of two major crew chief signings. Word has it Terry Adams has left Mike Edwards and the Penhall Racing team to join Brogdon - Kent Racing. Earlier this week we are told Tommy Lee, most recently with Ron Krisher, also joined the Brogdon - Kent team. Read more about BROGDON - KENT RACING MAKES KEY PERSONNEL ACQUISITIONS? CHAD HEAD TO THE BIG SHOW? Chad Head driving big show nitro next season? Word has it this could come to pass soon. Read more about CHAD HEAD TO THE BIG SHOW? KRISHER’S OPERATION PURCHASED BY STEVENS? Word has it soon-to-be married couple Erica Enders and Richie Stevens have made a significant investment into their future. Our source, a solid one, has told us they have purchased the racing operation of Ron Krisher. No word how many races the car will run this season at this moment. Read more about KRISHER’S OPERATION PURCHASED BY STEVENS?